This is probably one of the easiest chicken dishes ever. It's semi-Asian inspired and very delicious! Combine all the ingredients above in a bowl. Season chicken with salt and pepper and marinate in mixture for a few hours (overnight works too!). Bake for 25-35 minutes or until chicken is cooked through. While chicken is baking. Boil remaining marinate for 5 minutes or until it's reduced to almost half. 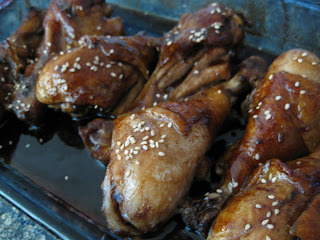 You can either brush glaze onto chicken halfway through cooking time or glaze when chicken is done baking. Sprinkle sesame seeds as garnish and serve with whatever side you like. 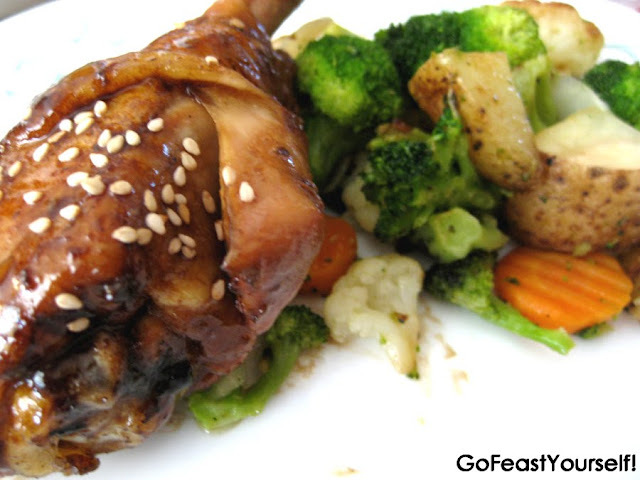 I ate mine with a side of mixed vegetables (just sautee a bunch of your favorite vegetables and use some of the remaining marinate mixture to flavor the vegetables). Hello my friend. As always I absolutely love your recipe's. I used 3 so far to feed my family. But I was wondering if you could come up with an out of this world recipe for a vegetarian. As I do not eat meet. So when I make a dish I can only eat the veggie portion of it, and that isn't the most flavorful part. I'm a Vegetarian by choice, so no worries. Just wondering if you'd like a new challenge. Thanks again, and keep up the good cookin.